El-Dakhla Oasis in the Western Desert, which is around 200km away from El-Kharga, is widely regarded as the most beautiful of the oases in that part of Egypt. 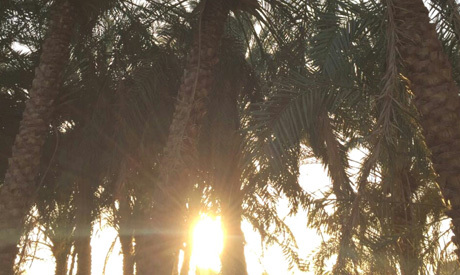 Water is more available in El-Dakhla than in El-Kharga oasis, making for more greenery, with palm trees and vast patches cultivated with cloves. 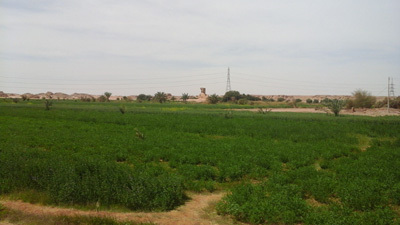 El-Dakhla, which is home to some 85,000 people, also has more livestock. In every village, there is at least one primary school and one secondary school, medical centre, an Al-Azhar institute which teaches the curriculum of the institution in Cairo. There are several football grounds, each of which serves a few villages. On the three-hour car trip from Cairo to El-Dakhla, we stopped several times. We first stopped by some high sand dunes, where we had a chance to take photos. Our second stop was close to Gabal El-Engleez, or the mountain of the Britons, named after the spot where the British camped in the early 19th century to search for phosphate. Britain built the oldest railway station in Upper Egypt, extending a railway line from Esna to their camp to transport phosphate. The railway station still exists, but the railway is covered in sand. Gabal El-Engleez is not easy to reach now, because it is far away from the road, but our guard told us that one can still find empty cans, buttons and spent bullets that were left behind in the area when the British moved on, having failed to find the minerals they were looking for. Phosphate was later discovered only 10km away from the site of their camp. The phosphate mines were our third stop, where phosphate was excavated and exported to Ukraine. The state built some 1,200 flats, several schools and a health centre for the workers. However, the workers preferred to commute to El-Kharga or El-Dakhla and the houses were left deserted. We also passed by the Natural Pyramids area, which holds more than 100 naturally-formed pyramids. Our next stop was the Valley of Camels, where various camel-shaped formations have naturally formed. We stopped in the valley and took few photos. The bus then stopped at the village of Balat, or the throne. It was the ruling centre in the old days and that is where it derived its name from. Unfortunately, it is now nearly completely ruined. We passed by Mut, the capital of El-Dakhla, on our way to El-Qasr village. The word Mut means "mother" in ancient Egyptian. El-Qasr is the main attraction in Dakhla Oasis. The medieval mud-brick houses and the twisting and turning alleyways are some of the features that distinguish the village. 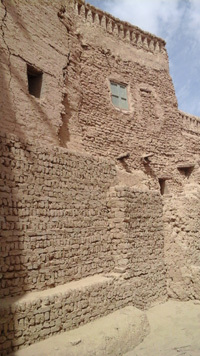 The village was built in the 12th century during the Ayyubid period on the remains of an earlier Roman settlement in order to serve as the capital of the El-Dakhla Oasis district. It is one of the few villages that still exist from that era. 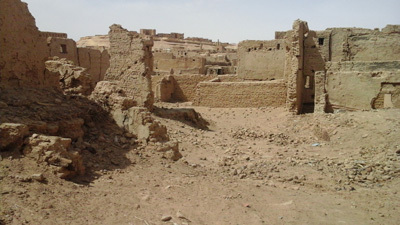 In order to preserve the village, the Ministry of Antiquities has managed to convince most of its inhabitants to leave and has given them alternative housing. 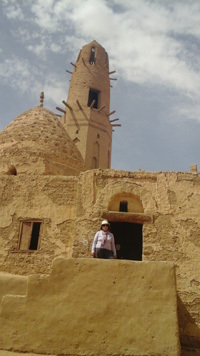 The Nasr El-Din El-Ayyoubi Mosque, which was built during the Ayyubid era, is one of the village’s major sites. The mosque's 21-metre-high minaret is the only part that has survived from the original mosque, while the rest of the building was reconstructed in the 19th century. Built from mud-brick like the rest of the village, the mosque is no longer used for prayer. However, newly married women do visit the shrine of Sheikh Nasr El-Din inside the mosque to seek a fertility blessing. A lot of gold and money have been found in the villages of Balat and El-Kasr. "People used to hide their money and gold in the walls or in the ground because there were no banks at the time," explained our informative guide Mohsen Abdel-Moneim. The village also has a 10th century madrassa (school). It was used as a court in the Ottoman and Mamluk periods. Later on, it was used as a school for teaching boys the Quran. The village's olive juicer was one of the most important pieces of equipment used at the time to extract olive oil. It is still in working condition but is no longer being used. The village's wooden saqia, or waterwheel, is still intact and is proof of the historic charm of the village. 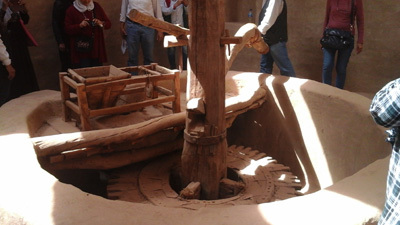 The wooden Saqia, or waterwheel, Al-Qasr village, Al-Dakhla. (Photo: Doaa El-Bey). 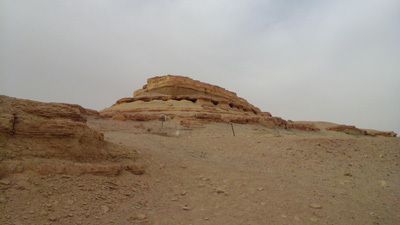 El-Mezawaka Cemeteries, El-Dakhla Oasis. (Photo: Doaa El-Bey). A visit to El-Qasr is not complete without buying some hand-made crafts made of hay from the village's small shop. Our last and most interesting stop was the hill-top El-Mezawaka Cemetery, or the "adorned cemetery." The cemetery acquired its name from the group of around 300 Roman tombs in the area that date back to the first and second centuries AD. Two of the finest decorated are the tombs of Petubastis and Petosiris, which both frescoes depicting harvest scenes, offerings to the deceased, and Gods like Amoun and Isis watching the deceased entering the afterlife. 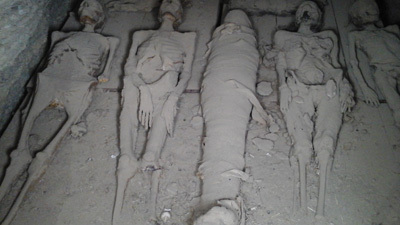 A family of mummies in one of El-Mezawaka tombs. (Photo: Doaa El-Bey). · It is one of those trips you should go on in a large group. · Choose the right time to visit. Avoid the hot months of the summer. · Go by plane to El-Kharga, then by bus to El-Dakhla. If you cannot afford it, transit for one night in Assiut before heading to El-Kharga. On our trip to El-Wadi El-Gadid, the weather conditions forced us to spend one night in Assiut. However, we took a direct trip back and it was extremely tiring, even though we stopped few times at rest houses along the way. · Even though you are required to pay to use the toilets at the rest houses on the road, do not expect them to be clean. · If you want to use the sand bath, which is said to have healing powers, do some research to choose a good place and a programme that is suitable for your condition. Give yourself enough time to enjoy the program and visit the landmarks of El-Wadi El-Gadid. I recommend you take the trip at least once in your lifetime.